As required by regulation and for the benefit of UVA personnel, outside contractors, emergency personnel, or other visitors to an area, UVA posts a Hazard Communication Sign on all laboratory, shop, studio, and makerspace doors, and other select room doors where hazardous materials may be present. The Hazard Communication Sign will display through symbols, icons and text which types of hazards (e.g. biological, radiological, chemical, or non-ionizing radiation) are potentially present beyond the door. The sign will also list PI(s) and emergency contact information. The potential hazards in the space may provide direction on personal protective equipment (PPE) or other safety precautions that are required for entry. When personnel are present in a space, enter as instructed; if uncertain about entering an unoccupied space, refer to the emergency contacts list displayed on the sign. 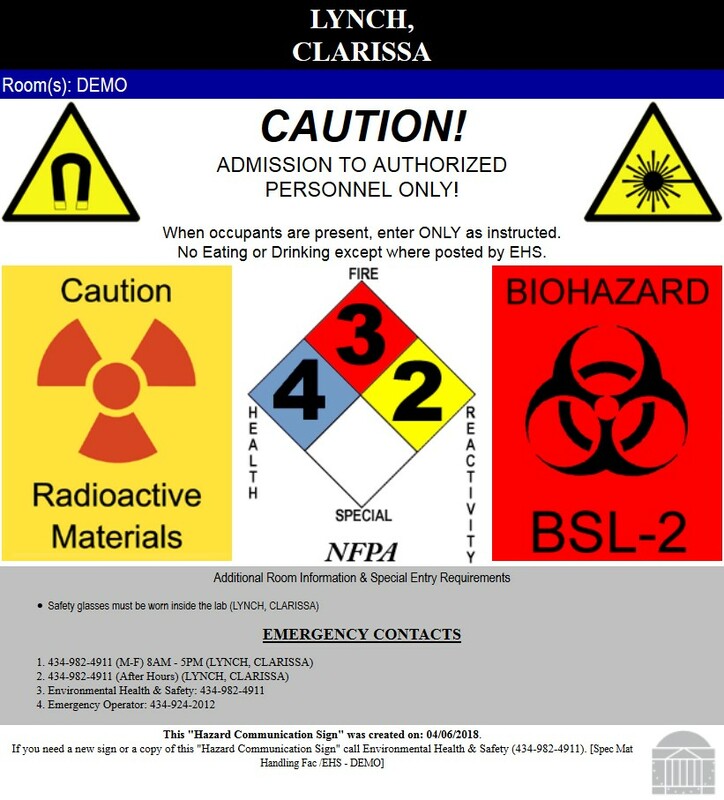 The Hazard Communication Sign (shown below) incorporates language as indicated in the publication CDC/NIH Biosafety in the Microbiology and Biomedical Laboratory, 5th edition (BMBL). The BMBL requires that a biohazard sign be posted at the laboratory entry when biohazardous materials are present. The Hazard Communication Sign is not intended to prohibit access, but to communicate that biohazardous materials may be present in the laboratory. University support staffs (Housekeeping, Facilities Management, Police, etc.) have been trained to understand that when laboratory personnel are present, they should enter as instructed. The Hazard Communication Sign (shown below) incorporates the National Fire Protection Association (NFPA) 704 fire diamond to communicate the hazard of short-term, acute exposures to chemicals that could occur as a result of a fire, spill or similar emergency. The fire diamond is color coded; blue for Health , red for Fire , and yellow for Reactivity/Instability . Health, Fire and Reactivity hazard severities are ranked 0-4. An area is rated according to the highest hazard materials known to be present. The white 'special' is for only select lab spaces with water reactive (W) material that would require alternative extinguishing media in a fire emergency. The Hazard Communication Sign is not intended to prohibit access, but to communicate that chemicals may be present in the laboratory. The Hazard Communication Sign (shown below) incorporates the radiation trefoil symbol when radioactive materials are stored or used in the laboratory. Individuals entering this room who are not approved to use radioactive material, must be supervised to prohibit unauthorized removal of radioactive material or contaminated items present in the room. Laboratories bearing this sign must be locked to secure radioactive material when no one is present in the laboratory. The Hazard Communication Sign is not intended to prohibit access, but to communicate that radioactive material may be present in the laboratory. The Hazard Communication Sign (shown below) incorporates the laser symbol when Class 3B or Class 4 lasers are present in the laboratory. Do not enter unless accompanied by lab personnel. When the laser is in operation, individuals entering this room must wear approved laser protective eyewear provided by lab personnel, if required by lab operating procedures for safe entry. The Hazard Communication Sign (shown below) incorporates the magnet symbol when equipment with strong magnetic fields are located in the laboratory. Do not enter unless accompanied by lab personnel, and limitations of entry are understood. DO NOT bring metal objects within the '5 gauss' line. Medical clearance is needed to work within the '5 gauss' line. There is danger entering with a pacemaker, any other surgically implanted metal items or accidentally implanted metal items e.g. metal splinters from machining metal. When changes occur door signs should be updated as soon as possible! An example of a Hazard Communication Sign is shown below.